Thrifty By Design: My pillow set is complete! My pillow set is complete! I finished my latest pillow set this afternoon. 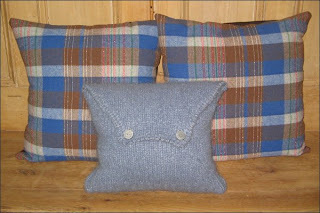 This is the Jacob turtleneck I felted and made into a pillow cover. After felting the wool, it's not itchy but a nice comfy addition to the pair of covers I created yesterday!